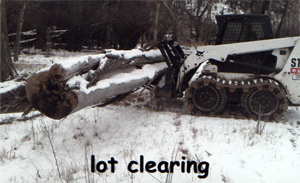 High Rise Tree Care Service utilizes it's knowledge in not only the tree care industry, but it's knowledge relating to contruction and heavy equipment usage. If you are doing slope drainage, wild life / ranch and wild fire prevention, the knowledge in these areas can save your land, it's value, and your money. 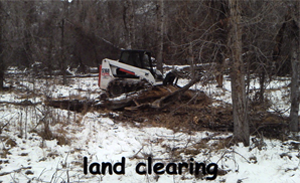 Whether you are land or lot clearing for fire mitigation, construction preparation or wild life vegetation management, you must first determine: what are we trying to accomplish? You must consider water drainage, property access, legal conservation or home owner association requirements. Once we evaluate the basics then we can address the requirements to reach your goals. When it comes to clearing ground floral you must remember that some items you will remove could take years to re-grow or replenish itself. Always look at the beginning - middle - and end of your project so that you achieve the results you desire. It may be at many times, not as easy as removing items. Some ground floral items you would like to remove , but in doing so, you may cause it to re-grow far denser than what you initially started out with. Or you may bring in unwanted weeds or plant life that is more harmful than what you just spent a great deal of money to remove. Sometimes all it takes is a day or two of our help to get you started , you may then be able to finish the project on your own.